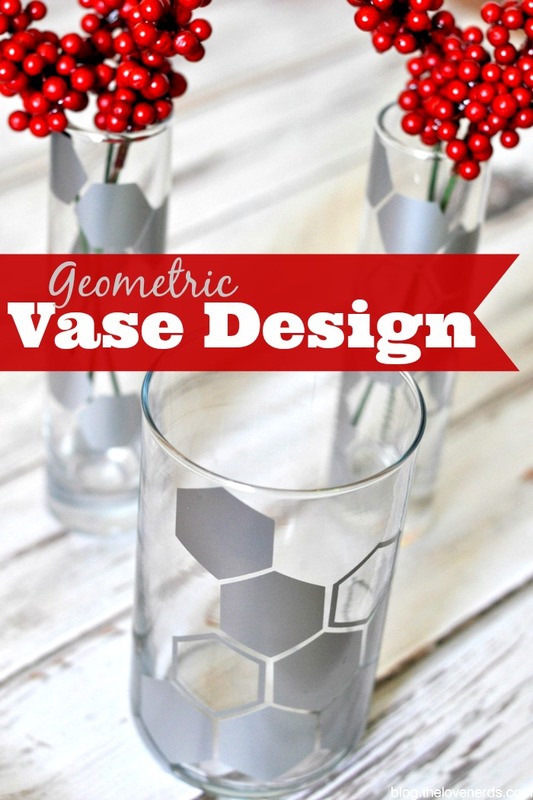 Making a great statement piece for your home doesn’t have to be hard which is why I am sharing these DIY Geometric Vases with all of you. I love the subtle design it brings to the clean glass cases I normally display in the house; my husband loves them because he thinks they look futuristic, like something out of the video game Mass Effect. No matter the reason why to like them, they were easy to make; all vases were decorated during 1 tv episode. Plus, it’s a relatively affordable DIY project. I used silver vinyl for my vases, cutting the shapes out with Silhouette. I cut out at least 10 hexagons in 4 different sizes each, a few being the outline version for some variety. This project would also work with regular stickers if you stumbled across a great sheet in a craft store. 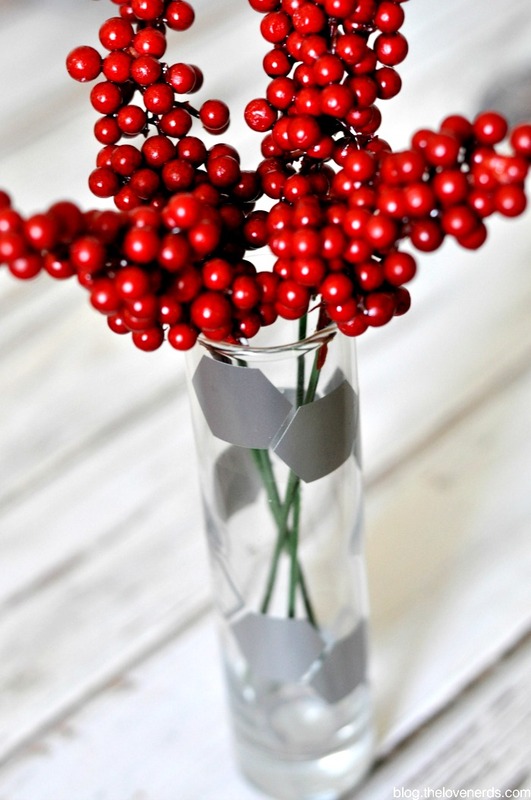 Tip #1: Use vases that you already having lying around the house or buy vases from a dollar store. Dollar stores usually have a great collection of glassware to check out first before every buying a more expensive vase. Tip #2: Make sure to clean the glassware well before applying any vinyl or stickers. Consider using rubbing alcohol or a water/vinegar mix. Tip #3: Don’t stress about perfection! You might have the urge to measure everything out and be super precise about placement of the shapes. Don’t. You won’t notice a little disparity here or there as you pass by the vases, so it’s not worth spending hours on perfection. Tip #4: There will be some slight air bubbles. You can use a credit card or something similar to gently rub out the bubbles. Additionally, there will probably be lit bubbles from glass imperfection. There is nothing that can be done about those. 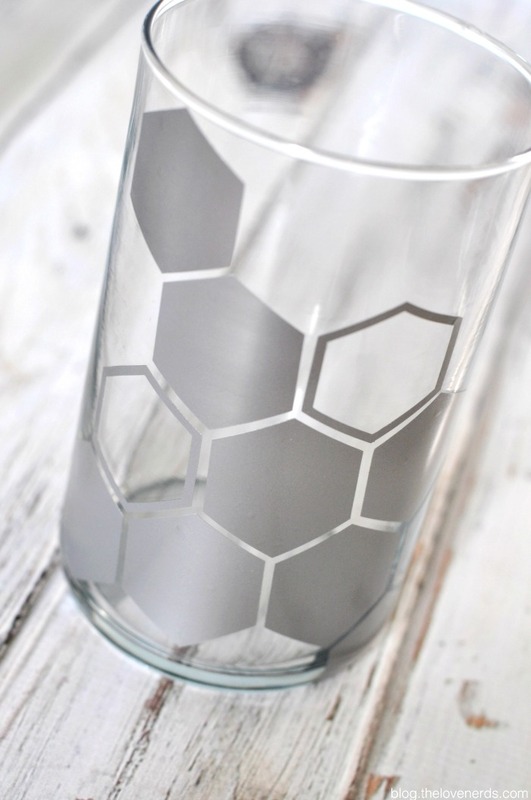 I chose hexagons because … well, just because I like them. My first choice was originally going to be triangles. This same concept would also work with any geometric shape that has shapes for you to connect or mirror. 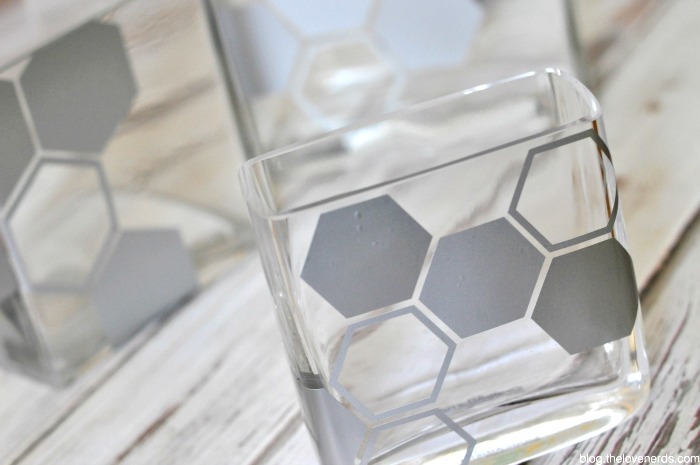 MATERIALS: Vases (any size or shape of your choice), geometric shaped vinyl or stickers, and an Exacto knife in case you need to trim any of the stickers on the top or bottom. DIRECTIONS: Make sure to clean the glass well before applying the vinyl or stickers. Then, start in your place of choice and build off that first sticker. The stickers with no middle are much harder to apply but can be done so with just a little bit of patient. When applying, I used no rhyme or reason. I just put a sticker where I thought it would look good. 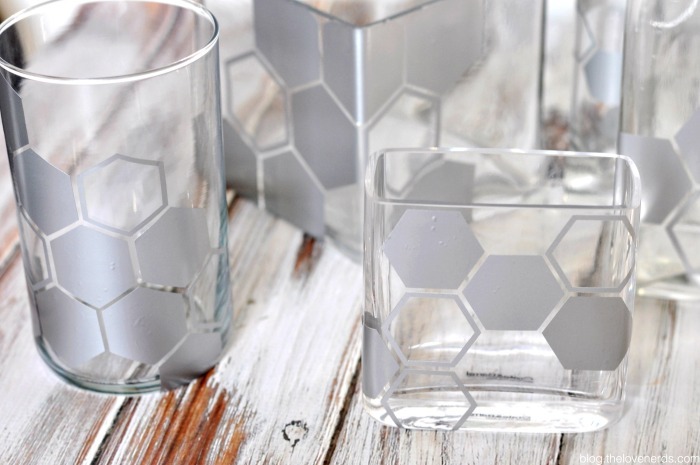 These are so cute, they remind me of honeycomb!